To celebrate Cousin Sip’s birthday, the gang went to Central City’s downtown brew pub yesterday for burgers and beer (and wine for some) and while mulling over my beverage options, the server suggested I try the Central City Super Sonic IPA, as according to him, it’s only available at that location and could disappear from the menu at any time. That sounded like a good pick to the Sip Advisor, especially if the brew couldn’t be located at liquor stores or even Central City’s other brew pub or brewery and tasting room in Surrey. 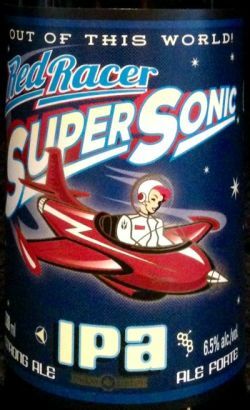 The beer is described as “Out of this world!” and while it didn’t send me into orbit, it was a solid beer, which paired quite nicely with my Crispy Crunch Burger. A lighter, smoother IPA and she’s totally right. The IPA came in at 68 IBU, which isn’t very hoppy, especially compared to the same brewery’s Imperial IPA, which jumps up to 90 IBU. In the coming weeks, I’ll have more from our visit to Central City, including Mrs. Sip’s daring choice of ordering the mystery tap beer, as well as trying a beer modeled after a childhood memory for many of us.